The F.A.L.C.O. crew had so much fun playing Trine 2 that we decided to go back and play the original Trine. While the two games are very similar, we probably should have played them in order since we found the controls were a bit more clunky and the "skill trees" were more like "skill twigs." There aren't many options! Nonetheless, we ran through Academy Hallways and Wolvercote Catacombs, and had a jolly old time. 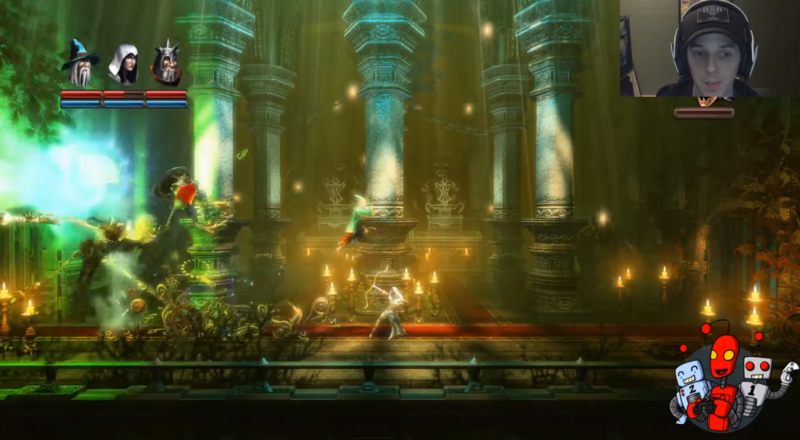 Trine definitely stands out as a game that does co-op right. Each character is unique and useful in different ways. Pair that with absolutely gorgeous visuals, and it's hard not to like this series. Watch us take on a couple levels in the video below. Our schedules have been a bit chaotic lately but we will be back tonight! We'll be playing Dead Island: Riptide because it's nearly Halloween and zombies are scary! That is, until I construct an electrified sledgehammer and start bashing some zombie skulls into the ground! Catch us at 8PM CDT on our Twitch channel.